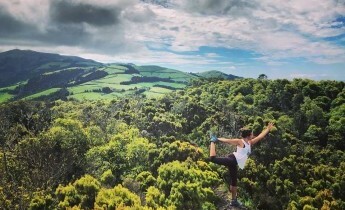 Retreat to Sao Miguel Island in the Azores, Portugal, this spring for an unforgettable week of outdoor adventure, relaxation and yoga with Petra! With their striking beauty, sub-tropical climate, pristine beaches, gorgeous green mountains, waterfalls and hot springs, this mystical Archipelago of islands are jewels in the middle of the Atlantic Ocean. Add casual, laid back European culture and cuisine and gorgeous upscale oceanfront eco-lodge accommodations, this retreat is bound to be a very special experience. Twice daily yoga classes taught by Petra, two hiking excursions, airport transfers, meals (with the exception of 2 lunches) and accommodations are all included in the cost. Direct 4.5 hr flights from Boston to Sao Miguel are reasonably priced and our retreat center is only a 15-minute taxi ride from the airport. Super easy stress-free travel, phenomenal accommodations, adventures, yoga, cuisine, and company... Amazing, right? We do hope you can join us! A €500 non-refundable deposit is required to hold your spot on this retreat. The balance is due 120 days prior to departure. Please note that while the official start date of this trip is April 14th, you will need to take a red eye flight from BOS (Boston) to PDL (Azores) on the evening of April 13th. We will send you flight recommendations upon booking. *Airfare to Ponta Delgada (PDL) - we will provide you with info on which exact flights to book. We fly SATA (Azores) Air and they let you bring one checked bag AND one personal piece of sporting equipment (surfboard, bike, etc.) for FREE! Reteat pricing starts at €1,600 (available room options and priceing can be viewed on registrarion page, link below). Please contact Petra for a spot on the waiting list in case of a cancelation!